One late morning in August, Jonathan Santlofer discovers his wife, Joy, in their living room, gasping for breath. In a surreal flurry, Santlofer frantically dials 911 while urging his wife to hold on. Soon he’s standing against the living room wall watching his wife die, even as paramedics try to save her. 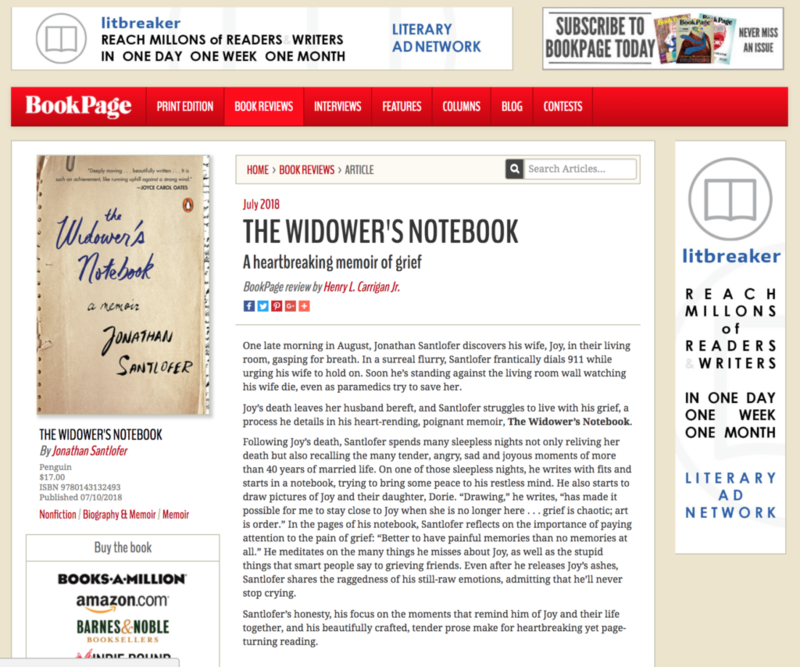 Joy’s death leaves her husband bereft, and Santlofer struggles to live with his grief, a process he details in his heart-rending, poignant memoir, The Widower’s Notebook. Following Joy’s death, Santlofer spends many sleepless nights not only reliving her death but also recalling the many tender, angry, sad and joyous moments of more than 40 years of married life. On one of those sleepless nights, he writes with fits and starts in a notebook, trying to bring some peace to his restless mind. He also starts to draw pictures of Joy and their daughter, Dorie. “Drawing,” he writes, “has made it possible for me to stay close to Joy when she is no longer here . . . grief is chaotic; art is order.” In the pages of his notebook, Santlofer reflects on the importance of paying attention to the pain of grief: “Better to have painful memories than no memories at all.” He meditates on the many things he misses about Joy, as well as the stupid things that smart people say to grieving friends. Even after he releases Joy’s ashes, Santlofer shares the raggedness of his still-raw emotions, admitting that he’ll never stop crying. Santlofer’s honesty, his focus on the moments that remind him of Joy and their life together, and his beautifully crafted, tender prose make for heartbreaking yet page-turning reading. This entry was posted in Reviews and tagged Book Page Review, Joy Santlofer, The Widower's Notebook. Bookmark the permalink.